If all the cattle in the world joined together to start their own country, they would rank behind only China and the United States in greenhouse gas emissions. But they’d have some competition from the cement industry, which also emits more than India (the country currently ranked 3rd). Is the above statistic true? 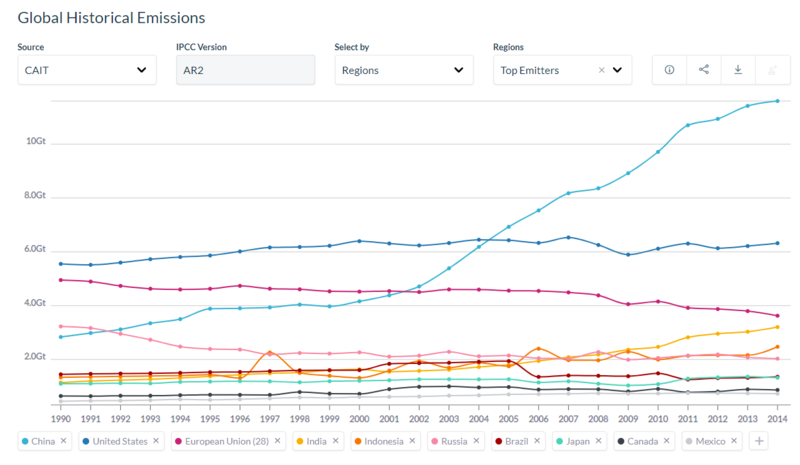 ClimateWatchData provide collated estimates of Greenhouse Gas Emissions by Region. From the 2014 figures, we can see China is the highest, USA second. In third place they have the European Union, which isn't a country. India is in third place for countries. USA is over 6 Gt per year. India is below 4 GT per year. The Food and Agricultura Organization of the United Nations provide estimates of greenhouse gas emissions for livestock. Cattle are the main contributor to the sector's emissions with about 5.0 gigatonnes CO2-eq, which represents about 62 percent of sector's emissions. The infographic below is more precise: 5,024 million tonnes. No error bars are given, but cattle are quite neatly between the USA and India (or The EU, if you prefer to include them). It is reasonable to say that, globally, cattle emit more greenhouse gases (in CO2-equivalent units) than all the emissions (including cattle) from the third-highest emitting country. Not the answer you're looking for? Browse other questions tagged zoology climate-change .